Are you seeking for ways and intends to make your windows gleaming yet again? Would you like to know how to skip nuisances like window cleaning without lifting a finger? You have chosen the right assistance – the experts of window cleaning in Manor House will deal with this matter in no time. Your windows along with their frames and sills will look great, we guarantee that! You will no longer need to sacrifice your spare time – the results of our activity will absolutely delight you. Our services merge highest quality with reasonable price rates, so don't wait – request an estimate now to save time, energy and money! We also provide our professional services in nearby areas: Finsbury Park, Harringay, Stroud Green, Stoke Newington, Highbury. 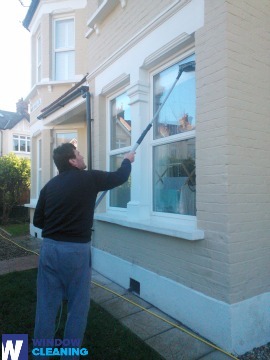 We provide residential and commercial window cleaning by using advanced methods. You can rely on our professionalism for all types of glass surfaces, roof windows and greenhouses. For windows placed up to your fourth floor, we use water-fed extension poles. This procedure is comfortable and allows risk-free cleaning procedures – the poles are attached to the water supply in the vehicle. For high-rise windows, our rope access option will grant you speedy and great end results. You can benefit from these services right now – just dial 020 3746 3113 and book a window cleaner! You can depend on the skills and experience of the professionals for cleaning all kinds of windows. The glass surfaces in our proficiency are: single or double windows, sash ones and bay windows. Of course, if you have French doors, garden windows, greenhouse or roof windows, we will make them sparkle, too. With our advanced ways of working and next-generation machinery, we can tackle all kinds of window cleaning, even with hard-to-reach glass panes. You can enjoy perfectly looking work environment with the help of the specialists of commercial window cleaning. You can count on our first-rate services for every kind of business premises. For example, if you have a small shop, we can carefully clean its windows by using water fed extension pole equipment – it helps us to go as high as the fourth floor. If you search for flawless look for the glass panes of a skyscraper in London and the nearby areas, we will use our rope access equipment. In both cases, you will enjoy excellent results immediately. With our quick and effective residential window cleaning in Manor House, you will enhance the look of your home immediately. We employ purified water for inside and out cleaning of your windows. We make this possible by standing on the ground with the help of water-fed extension pole system, which is safe both for your home and the cleaners. Discover more – call us on 020 3746 3113 or use our online booking form. You can also use our chat facility. Our assistants are active 24/7 – you will get answers to your questions. You can be one of our happy customers today!